Birdman is an odd one to wrap your head around; at times it’s a funny, clever and brave piece of filmmaking whilst at others it’s underdeveloped, gimmicky and disappointing. Many great characters establish themselves in the opening twenty minutes but unfortunately the film then slowly loses interest in them as the running time progresses. On the other hand though it’s a joy to see Keaton relishing and digging deeply into his complex role; his character is at once torn and determined, depressed and hopeful, as well as clearly suffering from some kind of psychological breakdown as he tries to refashion how the world sees both him and his acting career. 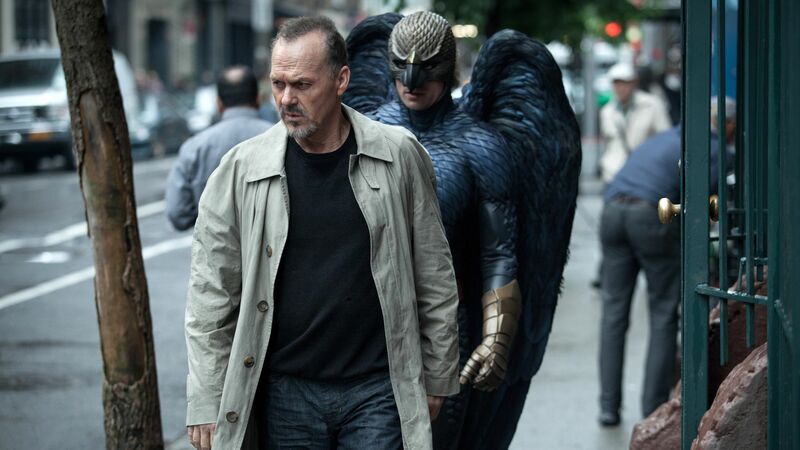 Keaton here plays an actor who used to rule the cinema boxoffice as the superhero Birdman but who is now a washed up, down and out guy who wants to turn his career around and be taken as a serious, artistic director. The film strikes a curious balance between criticising and promoting this common process of an actor reinventing his career; Keaton of course being an actor whose own star has now waned and who’s experiencing his own comeback through this film after years of being heavily associated with the Batman character. It is one of the film’s greatest strengths that it doesn’t come down hard on either one side or another on this issue, it just leaves us to form our own opinions. 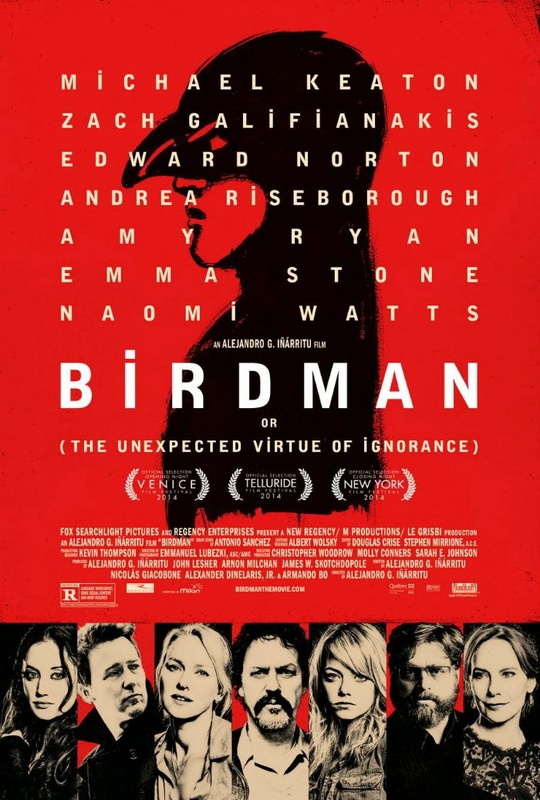 However as well as its refusal to comment works well in regards to its stance on reinventing actors careers, Birdman does often hold back from commenting on other subjects which leaves them feeling underdeveloped and lacking in depth. For example Twitter is often mentioned in the film as a platform by which you can gauge popularity, generate false admiration and potentially gain fleeting fame and power. It is loosely set up in opposition to the waning fame of the lead character but nothing ever really develops from that. The same goes for the film’s discussion on other topics such as the perceived divide between theatre and cinema and the conflict between critics and filmmakers… they aren’t subjects that are looked at in any depth, the just are brought up and then abandoned. Birdman plays a sort of visual trick on us where through clever editing it has the appearance of being filmed in one single continuous take, but as technically impressive as this is it’s more of an interesting gimmick than anything that really develops the film’s themes or moves the plot along. In fact perhaps it has actually hampered the film because it seems so intent on making sure that this visual trick works that side characters, who have had interesting stories set up for them, are swept aside part way through the film, never to be reconnected with. Thankfully we have here a cast that’s talented and clearly dedicated to the film and consequently their characters all feel far more developed than they frankly have any right to be. Only Keaton has a character that meaningfully develops as that’s who the camera chooses to follow. All in all Birdman is a curious film with its own fair share of merits but unfortunately it gets a little too caught up in its own cleverness and forgets to generate any real emotional impact or develop its characters. It’s a glittering technical exercise which holds a lot of promise but ultimately doesn’t really follow through on it. What is the film’s greatest strength? It’s a toss up between Keaton and the visual tricks the film pulls off. Its greatest weakness? It’s underdeveloped and not quite as clever as it thinks it is. Would I see it again? Perhaps, I enjoyed it at the time but I suspect it would be a harder pill to swallow twice. Thanks for reading, please let your comments take flight below! Everybody here is solid. But it’s Keaton who walks away from this better than he’s ever been before. Good review Rumsey. Thanks Dan, Keaton was great here! Absolutely agree. Well put. Enjoyed the film but feels like the director is screaming “LOOK AT ME” the entire time. Yeah it takes away quite a lot from the film unfortunately. Good review, man! I seemed to enjoy it a bit more than yourself. I loved the cast and the ever roaming camerawork and thought it a great insight into showbiz and the ego’s that come with it. Thanks Mark! I loved the cast too but I just thought it didn’t quite reach it’s potential. Certainly not a bad film but I didn’t think it was a great one either. I’m completely with you. It’s a good movie but not nearly as profound as it thinks it is. It definitely handles some things better than others and ultimately it’s a film that really isn’t saying much. That said I still found myself hypnotized by it. So glad to hear you agree Keith, thought I would be on my own on this one! Part of my enjoyment of the film was it’s magical realism. I write magic realism and I love reading it, but I rarely see it in movies (like “Stranger Than Fiction” or “Ruby Sparks”). Those bits really brought a smile to my face. Yeah I too do like some magical realism. Have you seen Pans Labyrinth? You really should see it if you enjoy Magical realism, it’s a great example of it in films and it’s a powerful film to boot.